This was a good year. But wait to see what I have to say about 2015. When this dish arrives at your table, gently wave your hand above it to experience the lovely aroma. Aroma is an essential part of flavor. This is flavor in spades. Tender chunks of very tasty lamb dot the pasta, which is partially covered with cheese. The rich tomato based sauce is properly thick and redolent with thyme, rosemary, and fennel seed. The fine flavor of this ragout will haunt you for weeks. You might find your car heading automatically for Piatanzi. Don’t fight it — just succumb. Surely you have a Reuen before unless you never come out from beneath your rock. It is one of America’s most popular deli and pub sandwiches. Corned beef, Swiss cheese, sauerkraut, Russian dressing on lightly toasted (or grilled) rye. 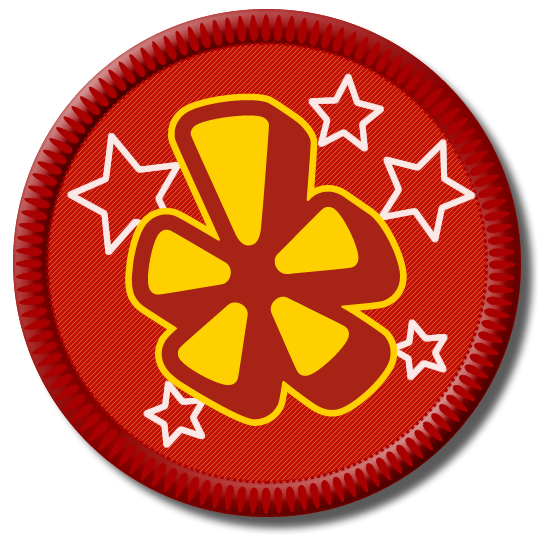 Honorable mention at the 4th Annual Taste of Rui Rancho, 2014. What sets this Reuben apart is the bread: light and dark swirly rye and pumpernickel. Fabulous. 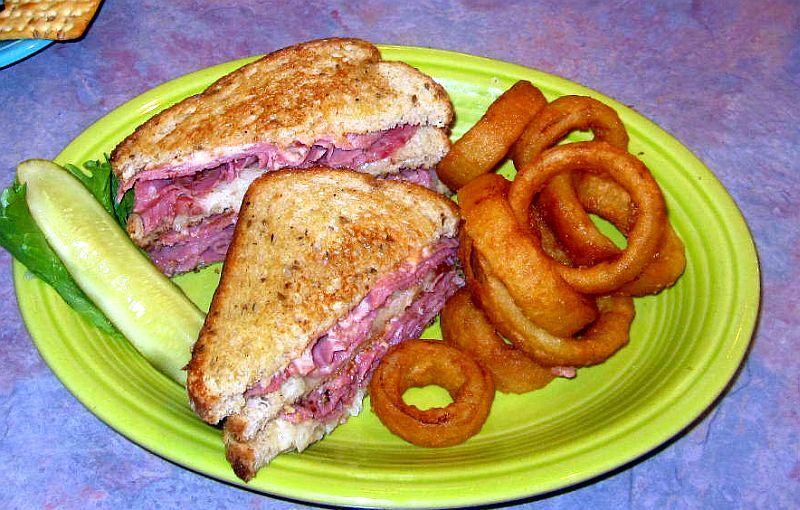 The corned beef is very tasty, moist, and tender. A gently beautiful sandwich that oozes juice down your cheeks. The excellent fries are beer battered. Never soggy. 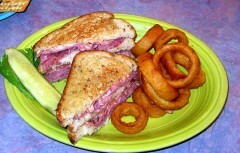 My friend Deanell has been bugging me for months to try the Reuben at O’Hare’s. I had my first taste of this creation while I was judging the entries at the 4th Annual Taste of rio Rancho last weekend. Crazy good (I gave it the highest marks possible). 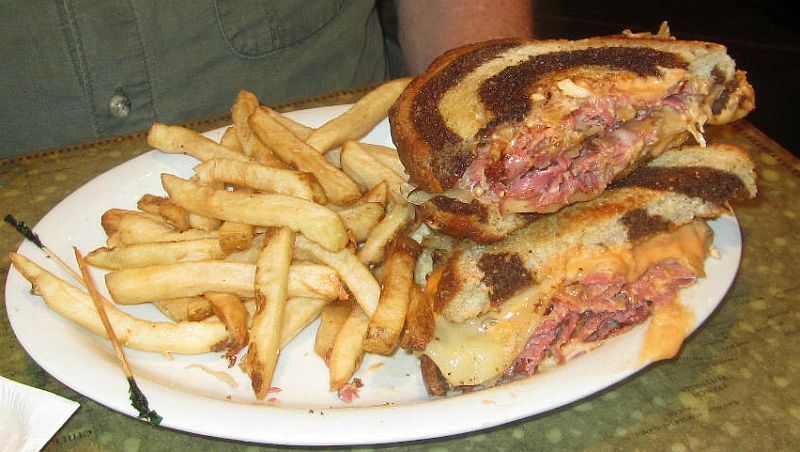 So yesterday, Deanell and I hightailed it to O’Hare’s and we each had — you guessed it — Reubens. This is like no Reuben you have ever had. Not brisket, but round. Warmed on the flattop for less than 30 seconds, it remained wonderfully moist. Sliced thin. Delicious light rye. This is a three-napkins juicy sandwich. The real surprise was the dressing. It is a mayo-based remoulade with horseradish, cayenne, lemon, honey, and finely chopped capers. Nice kick. Get an extra tub and slather it on the beef. This is what places this Reuben in a class by itself. And dip your rings in it, too. This sandwich is amazing . Among the best in town. Deanell was right. The ribs are slow cooked, and the tender pork slides easily off the bone. The meat is very tender and tasty. 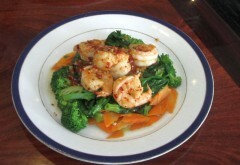 Joe takes two days to prepare this fabulous dish. The sauce is thick, rich, and complex. Get here early for the specials. They sell out quickly (I got the last serving, which Joe saved for me). This dish has already earned a place on my coveted Best dishes of 2014 List. 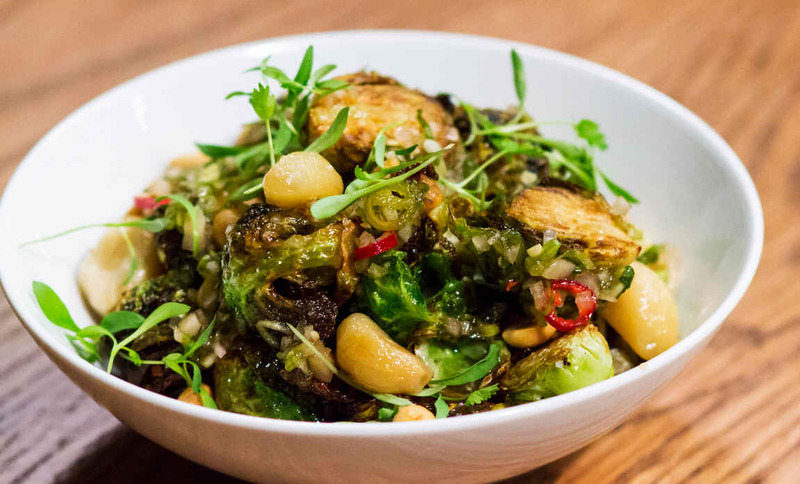 Crisp fried sprouts, garlic, peanuts, tamarind, and bird peppers (the chef, Chef T, is Vietnamese). Wimps can opt out of the incendiary peppers, but I think this would be a serious mistake. The blend of all the elements masks the searing heat (50,000 – 100,000 Scovill units). If I told you Brussels Sprouts haters out there that this is a fantastic appetizer, you might think me daft, and you would be wrong. Chef T will change that for you. Everything at Budai is out of this world. Chef and co-owner Hsia Fang is a culinary wizard and paints his food artistically on the plate. Pea Tips are the tender shoots of snow peas, and are gently stir fried. The shrimp are gently spiced with red pepper flakes and more, and are placed atop the bed of Pea Tips. For the best taste, they should be eaten together. This is a stunning combination, and is sure to tickle your palate. Brisket is one of my favorite cuts—and Wagyu brisket is the hands-down, best brisket I have ever had. This popular cut, taken from the breast, lends itself to a wide variety of uses from braising to smoking to curing for corned beef. 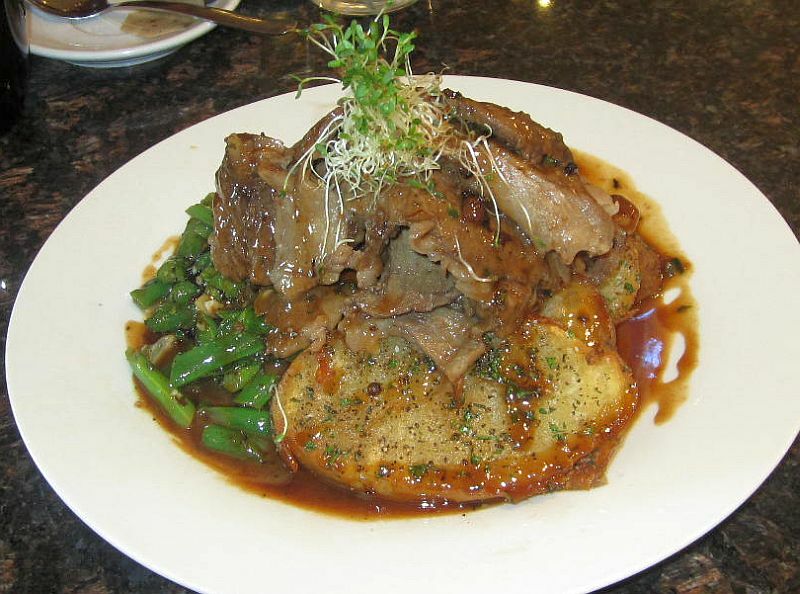 Traditionally, brisket is cooked long and slow to ensure the tenderness of the finished dish. Lower-grade briskets have rather lean meat and a cap of fat that can vary in thickness. Wagyu brisket has abundant marbling that bastes the meat from the inside as it cooks and a substantial fat cap that bastes the meat from the top down throughout the entire cooking process. Texans barbecue this cut, and that seems criminal to me. 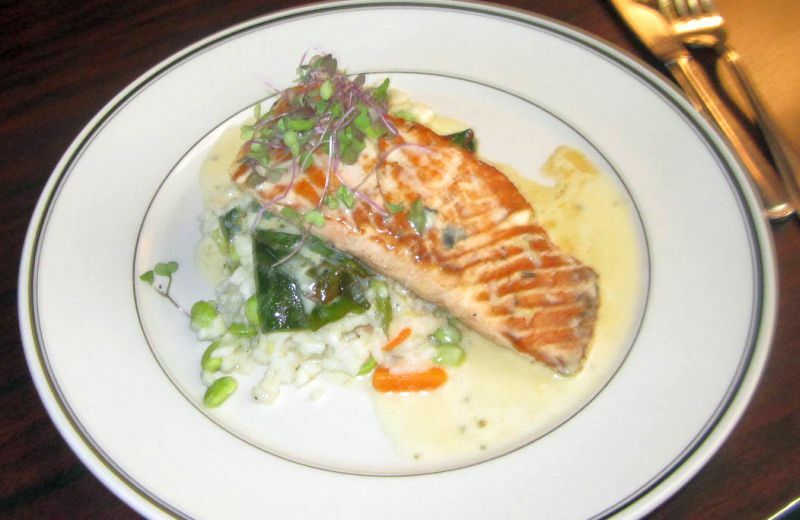 I have eaten salmon all over the world, including in Alaska where I had some every day for two weeks. This salmon at Standard was cooked perfectly— barely crisp at the grill marks and buttery soft on the inside. The first bite of this will really get the salivary glands into high gear. It is served atop a perfectly done risotto containing four vegetables. Large portion, but Marjorie ate everything except the plate (and then got to work on my meatloaf). Ginger beer-braised with a creamy potato salad. 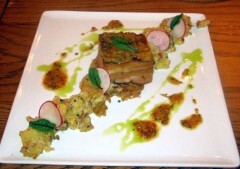 Pork belly is back in again, and I’m sure glad about that. This is a truly outstanding dish, and it is beautifully plated. I asked Sonny if Chef T. did the plating, and he replied that T. was in Augusta that weekend, having been invited to be the executive chef for the masters Golf Tournament. Nice gig. This is one heckuva fine treatment of pork belly. Not fatty, not greasy, bur perfectly cooked. The ginger is mindbending. I am a pork belly freak, and this is one of two absolutely stunning pork belly dishes in The Duke City (the other is at Budai Gourmet Chinese, Dong Bo Pork). Stumbling Steer’s pork belly has made its way to a spot on my coveted Best Dishes of 2014 List. 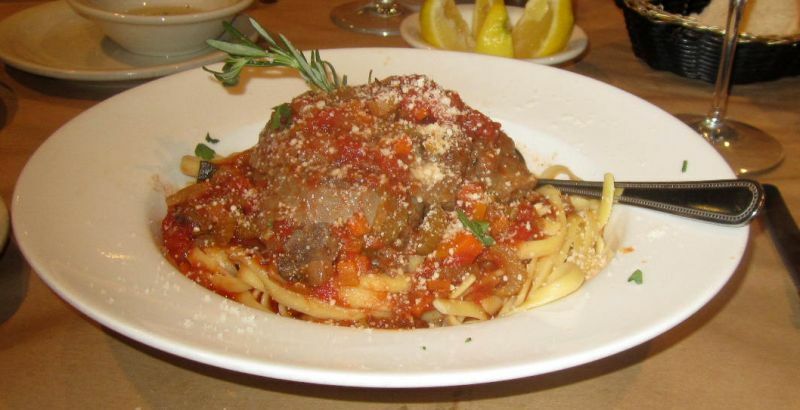 Osso Buco at Joe’s Pasta House. Watch for Joe’s specials on his Wen site. Every now and then he will prepare Osso Buco , one of his (and my) favorite dishes. 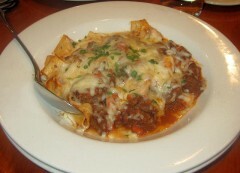 He prepared this dish on April 19 specially for me and 5 of my favorite friends. Made with veal shanks, it was as tender and tasty as can be. An unforgettable meal. Thanks, Joe. Potato gnocchi, clams, mussels, shrimp, scallops, marinara, pinot grigio, garlic, tiny tomatos, chile flake. 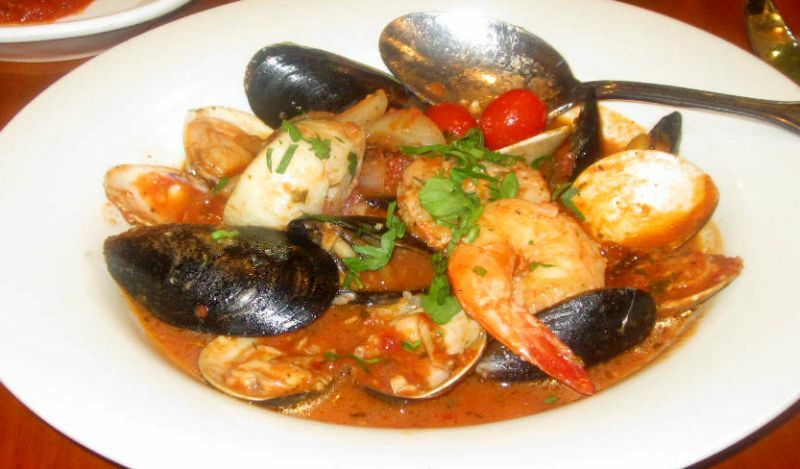 This is the very best gnocchi–seafood dishes I have ever had, anyplace, including Italy. The seafood is fresh, tender, and succulent. 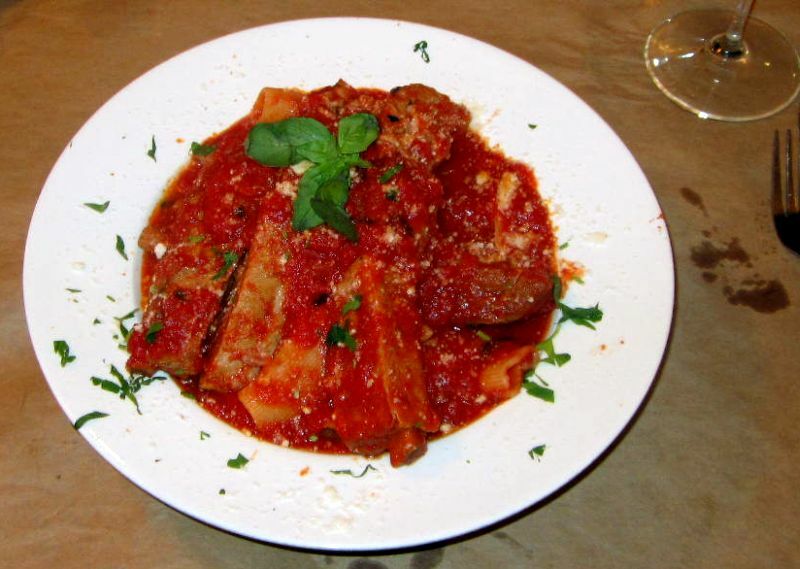 The garlic, while plentiful, remains sweet, and the pinot grigio-marinara is perfect with just a (correct) hint of acidity.Try a small spoonful of this sauce with a grape tomato, and the tomato will explode in your mouth with an unbelievable taste. Pete Lukes, the owner-chef, told me that this is his personal favorite here. Mine, too. 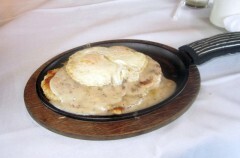 Best Biscuits and Gravy I have ever had. Anyplace. Perfection. Super-flaky biscuits, tasty gravy that is not oversalted, sausage patty that is delicious and not greasy, and perfectly fried eggs. Chef-owner Aaron Worrell has a real passion for food. Pork belly is difficult to prepare correctly. Maxime has put together a magical dish here. Slow-braised in Belgian beer, this is tender, aromatic, and beautifully spiced. The sauce is thick and complex. 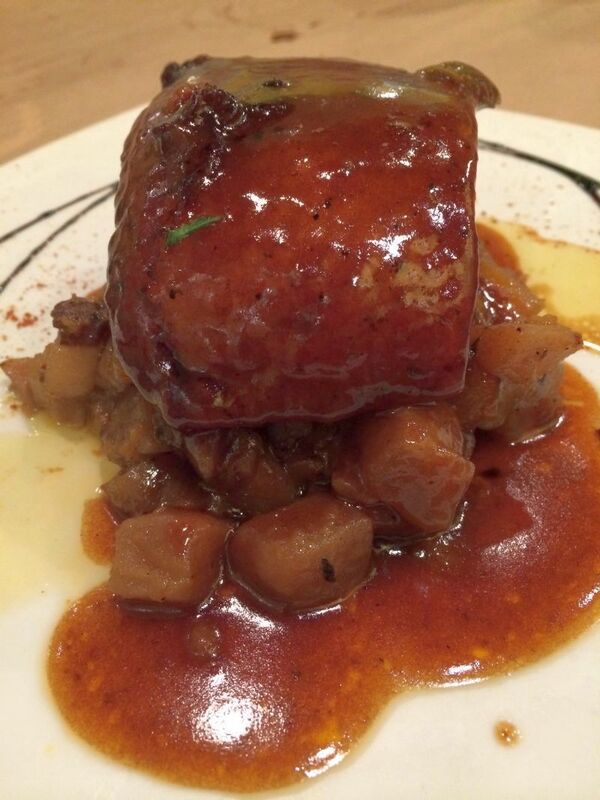 The fatty part of the pork is heavenly — neither greasy nor overdone, a tribute to Maxime’s culinary skills. The whole thing rests atop a bed of root vegetables that have been individually cooked so that all are at their peak of taste and texture (no mean feat). Thanks, Maxime. This dish is as close to perfect as it gets. Beg for a Belgian abbey-brewed ale to accompany this. Check back for additions, added when the whim strikes me.